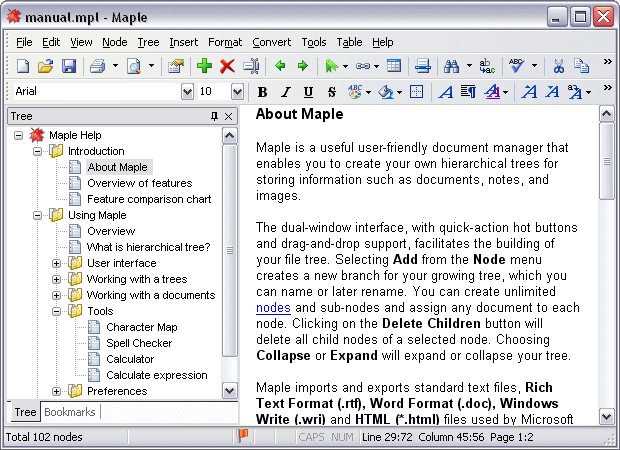 Maple is a useful document organizer that enables you to create your own hierarchical trees for storing information such as documents, notes, and images. Selecting Add Node from the Tree menu creates a new branch for your growing tree, which you can name or later rename. You can create unlimited nodes and sub-nodes and assign any document to each node. Clicking on the Delete Children button will delete all child nodes of a selected node. Choosing Collapse All or Expand All will expand or collapse your tree. Documents can be loaded from file and saved in .rtf, .txt, .doc, .wri, or .html format. Maple supports rich text formatting as well as drag-and-drop.